It was a special day for Gareth Bale. 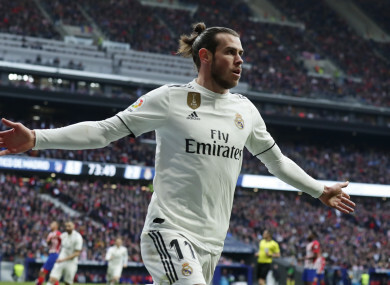 REAL MADRID BEAT bitter rivals Atletico Madrid at the Wanda Metropolitano for the first time, as Gareth Bale’s 100th goal for the club helped secure a 3-1 win to move them up to second in La Liga. Not only did Madrid deserve their victory, the manner of the win was particularly impressive. At times, Atletico looked rattled and frustrated, a rare sight in LaLiga. Santiago Solari’s side could yet end the weekend eight points adrift of Barca, who take on Athletic Bilbao on Sunday, but they are finding form at the right time. A late title surge could still be on. An early flashpoint saw Gimenez give Vinicius a dressing down after feeling he had gone to ground easily in the area, even though the Brazilian did not appeal for a penalty. A little later, the winger left Atletico’s centre-back in his wake and then lured him into giving away a spot-kick. It was a day to forget for the defender. Email “Gareth Bale hits 100th Real Madrid goal in impressive derby win”. Feedback on “Gareth Bale hits 100th Real Madrid goal in impressive derby win”.